When triggered by an alarm system, the ENFORCER Auto Dialer can call up to 5 numbers and deliver a beep alert repeatedly for one minute. The receiver can then listen in to the room occupants or can disarm the system. The dialer includes a home mode (acting like a door chime when the owner is present) and a panic button. The 105dB built-in siren alarm can be programmed on or off. 16-Digit large display with date/time and function icons. 2 (N.C.) Triggers for multiple zone security. Remote monitoring — user can call in to listen in to room sounds and arm/disarm dialer. Remotely listen in to room sounds or disarm during call back. 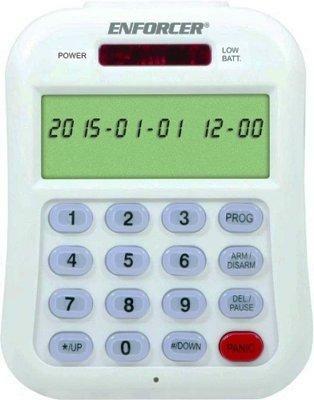 Programmable PIN number and entry delay timing. 5 Programmable emergency telephone numbers (up to 32 digits each). Programmable auto-dialing cycle repeat times. Home mode function (acts as a door chime when user is at home). Built-in flash memory to protect against system data loss in case of power failure. Low-battery indicator for backup battery (battery not included). DC power input jack (3.5mm phone jack, not included). 9V battery backup (battery not included). Built-in 105dB alarm (with programmable alarm on/off). Built-in auxiliary output for external alarm or siren.